Marine phytoplankton cells grow in close association with a complex microbial associate community known to affect the growth, behavior, and physiology of the algal host. The relative scale and importance these effects compared to other major factors governing algal cell growth remain unclear. Using algal-bacteria co-culture models based on the toxic dinoflagellate Gymnodinium catenatum, we tested the hypothesis that associate bacteria exert an independent effect on host algal cell growth. 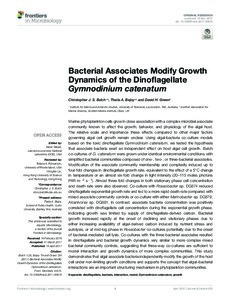 Batch co-cultures of G. catenatum were grown under identical environmental conditions with simplified bacterial communities composed of one-, two-, or three-bacterial associates. Modification of the associate community membership and complexity induced up to four-fold changes in dinoflagellate growth rate, equivalent to the effect of a 5°C change in temperature or an almost six-fold change in light intensity (20–115 moles photons PAR m-2 s-1). Almost three-fold changes in both stationary phase cell concentration and death rate were also observed. Co-culture with Roseobacter sp. DG874 reduced dinoflagellate exponential growth rate and led to a more rapid death rate compared with mixed associate community controls or co-culture with either Marinobacter sp. DG879, Alcanivorax sp. DG881. In contrast, associate bacteria concentration was positively correlated with dinoflagellate cell concentration during the exponential growth phase, indicating growth was limited by supply of dinoflagellate-derived carbon. Bacterial growth increased rapidly at the onset of declining and stationary phases due to either increasing availability of algal-derived carbon induced by nutrient stress and autolysis, or at mid-log phase in Roseobacter co-cultures potentially due to the onset of bacterial-mediated cell lysis. Co-cultures with the three bacterial associates resulted in dinoflagellate and bacterial growth dynamics very similar to more complex mixed bacterial community controls, suggesting that three-way co-cultures are sufficient to model interaction and growth dynamics of more complex communities. This study demonstrates that algal associate bacteria independently modify the growth of the host cell under non-limiting growth conditions and supports the concept that algal–bacterial interactions are an important structuring mechanism in phytoplankton communities.